Unfriended! Was it something I said? I’ve recently lost a few friends, but I’m not grieving… not the loss of numbers, anyway. I’m grieving the lost opportunity for dialogue. I’m not sure who they were, or even how many unfriended me. I don’t keep close track of the ebb and flow of numbers of FB friends. But I do know the last time I checked (a couple of months ago?) it was well above 900. This past Monday afternoon, after reading a post by someone saying “good riddance” to those who unfriended him during the flurry of posts in response to Charlottesville, I decided to check my own numbers. It was 880ish. Certainly not this: thanking Matt Frankenfield of Trifecta for solving my iCloud problems. And not this: kudos to the APD and that cute picture of their K9 partners. And most certainly not this: the Morning Call link I shared about the Laundry Day ministry. But maybe this: when I questioned the Christian content of the Capitol Hill Bible Study with Cabinet members led by Ralph Dollinger? Or this: noting that I personally wouldn’t qualify to immigrate to the U.S. under the rules set forth by this administration? Or this: “Charlottesville: This is racism” – a repost of John Pavlovitz? Then again, maybe it was what I said about white supremacy and Donald Trump at the Center Square rally on Sunday afternoon in Allentown. Or the fact that my name appeared in the paper as one of the speakers who stood on the monument steps with clergy and laity, black, white and brown, cisgender and LGBTQ, Christians, Muslims, Jews and atheists. Whatever caused a few dozen people to unfriend me, I’m not grieving the dropping of numbers on my FB page. But I do grieve the lost opportunity to engage in dialogue, even within this limited social media context. I’m fortunate to have FB friends (some I haven’t met in person) who have very different political and religious perspectives, and who post or pm me with opposing views from time to time. I read what they post and send me. Sometimes I respond, sometimes I just think about it. And I hope they think about what I post and respond to them. Because that’s what dialogue is about. That’s what friendship is about. And that’s the way transformative change happens, to me as well as to others. Fortunately, my ‘opposing viewpoint’ FB friends are NOT among those who unfriended me. Thank you for staying the course! Fair warning though: I am at an early stage of understanding on many of the issues I am sharing. I am educating myself as I go, and I’ll be sharing more and more as these issues continue to percolate through us all. BTW – I just checked my FB friends count: two days later, it’s 925. Welcome to new friends I’ve made in the past few days! And perhaps some of those who unfriended me are back. I hope so! Did you hear about the Capitol Hill bible study that includes members of President Trump’s Cabinet, led by Ralph Drollinger? If you haven’t heard of Ralph Drollinger? He’s a 7’1″ UCLA basketball star, an All-American who was involved in sports ministry through Sports Outreach America, and Athletes in Action. In 1997 he founded Capitol Ministries, a program of evangelism in each of the U.S. capitols, after he graduated from The Master’s Seminary. If you haven’t heard of The Master’s Seminary? It’s been around for 30 years, but it’s not accredited by the Association of Theological Schools. The ATS, which accredits 270 schools across the country, says the mission of the ATS is “to promote the improvement and enhancement of theological schools to the benefit of communities of faith and the broader public.” (ATS itself is recognized by the Council for Higher Education Accreditation.) The Master’s Seminary is one of many Bible colleges that do not meet its standards. So Ralph Drollinger didn’t graduate from an ATS accredited institution and he is not credentialed as a pastor by any denomination. So what? He obviously is a dedicated Christian, and anybody can lead a bible study, right? Of course! But you’d think members of our nation’s Cabinet, this powerful group of people in Washington, would bring the most knowledgeable scholars with PhDs in biblical studies to help them glean insights so they might better understand their biblical calling as Christian leaders in the federal government! But they didn’t. So I guess it’s up to me. Here am I, rushing in where angels fear to tread. Not a PhD scholar, but what I learned about the bible (and Jesus) in seminary leads me to offer a few suggestions for Mr. Drollinger. Here are a few biblical texts and “launching” questions that I hope would bring new insight to the faithful in his Bible Beltway study. First, since these Cabinet officials really are just beginning their tenure, I’d suggest they take a close look at the text Jesus used at the start of his messianic tenure. Read Luke 4:16-21. Then ask participants to name the groups Jesus says he will bring good news to. Write on newsprint as they name them: the poor, prisoners, those in need of health care, and the oppressed. Ask what implications this has for their calling as Christians in this administration. If additional references are needed to facilitate conversation, read and discuss Isaiah 1:16-17, Jeremiah 22:15-16, and of course, Matthew 25:31-45. Second, the news article stated that Mr. Drollinger began his bible study with the Sermon on the Mount; I’d suggest that he now distribute a copy of the sermon on the plain (Luke 6:20-25). They’ll immediately see in Luke that Jesus adds four “woes” to the “blesseds.” Ask them to name and list them on newsprint: the blesseds are for the poor, the hungry, those who weep; and the woes are directed to the rich, the full, and ones who are laughing now. Ask your Capitol Hill participants which group they identify with, and why. Give them a few minutes of silence to reflect. Then ask them to identify how each of those groups would be treated in the current administration’s policy agenda. What would Jesus do? Be specific. This teaching about humility is self-explanatory, of course, however to drive home the point, when they’ve finished, tell the team bragging about having the most references they don’t win anything! Note this also makes an excellent memory verse for members of the cabinet, not to mention President Trump. Well, it looks like I’m at my Hebrews 11:32 moment: “What shall I say, time will not allow me to tell” all that I’d like to suggest. I haven’t even mentioned Galatians 3:23-28, that great manifesto of equality! But I stop here because I realize this Galatians passage may be difficult for Mr. Drollinger. The Master’s Seminary has an all-white-male faculty and states its purpose is “equipping men for a lifetime of effective service in the church” (emphasis mine). So Galatians 3:28 might stretch him a bit. May God bless to our understanding these scripture readings, and to God’s name be all praise and glory! Amen. If the shoe doesn’t fit . . . Wherever we are, whenever we can, we need to take a stand in support civil rights for everyone. In my testimony at the Allentown City Council meeting on July 19 in support of a ban against conversion therapy, I used an illustration that many found helpful, and I promised to publish it here. Considering President Trump’s tweet last Thursday banning transgender individuals from serving in the military, and the subsequent stance of the Justice Department against LGBTQ civil rights, it is obvious that anti-LGBTQ initiatives are going to continue. Here’s hoping my story helps people see this issue from a new perspective. “Sometimes I can be seen not only wearing this tricorn hat but also clothing from the colonial era for our commemorative services at the Liberty Bell Church. I also wear a pair of colonial era straight last shoes. “For those of you who are not colonial re-enactors or historians, I need to explain that in colonial times, shoes were made to fit either foot, which is to say, they fit neither foot. There was a single form used to make shoes, called a “last.” It was straight, so you could put either foot into either shoe. Eventually, the shoe would conform to the shape of your foot, or perhaps your foot would conform to the shape of the shoe. And if it hurt it hurt! “Thank goodness for the invention of the machine lathe in the 1850s when they began to make shoes in left and right styles. And thank goodness for the eventual manufacture of adult sizes from 4-16 and widths from AA to E, resulting in 60-some shoe size combinations that we are free to choose from. We wear whatever size fits us best! “Council members, perhaps you’ve had the experience, the painful experience, of forcing your foot into a shoe that does not fit properly; imagine how painful it is when someone tries to force you into a way of being that does not fit! Unfortunately there still are people in America who think everyone should fit into one straight shoe. “I begin with this illustration because I hope it is a memorable image. If I’m known to people in the wider community, it’s probably because I wore this tricorn hat all over Allentown during our city’s 250th anniversary a few years ago. People know me as the pastor who dresses in colonial garb. But few people know that, in addition to being pastor of the Liberty Bell Church, I also have a master’s degree in pastoral counseling. “For almost a decade, I engaged in a counseling ministry, working with clients from Bethany Counseling Service, the Church Renewal Center at Good Shepherd, as well as with a psychologist in private practice in Bethlehem. So I am well-aware of the American Psychological Association and the American Psychiatric Association diagnoses and standards of care. And I am well-aware that it is unethical to try to force people to fit into a heteronormative mold. But there are others present who are credentialed in those disciplines who can speak more directly to those standards. I speak as one who now is primarily a pastor. “I respect my conservative Christian colleagues: we agree on many things, we disagree on others. Certainly each of us is blessed to be Christians in America: each is free to have our own opinions and engage in our own ministry, including counseling people according to our interpretation of the Bible. There is nothing in these this legislation that interferes with clergy or prohibits them from counseling adults according to their interpretations. This legislation only affects licensed professionals, and it only applies to minors. Forcing conversion therapy on a child or a teen is the antithesis of personal freedom, and I would hope my colleagues would never encourage this. “I personally understand the teachings of the bible very differently from many of my conservative colleagues. I’d be happy to talk about the bible with just about anyone, just about anytime, on these and other issues. Because it’s obvious to me from a Christian pastoral perspective that the only type of conversion Jesus was interested in was related to your soul, not your sexual orientation. The following week, Council passed a ban on gay conversion therapy for minors. As United Church of Christ clergy we applaud the landmark decision of the U.S. Supreme Court in favor of marriage equality. 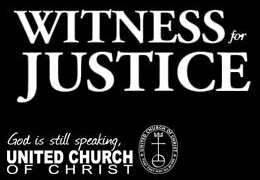 The UCC has a long history of social justice advocacy as well as pastoral support for victims of injustice, including those in the LGBT community. In 1972 the UCC ordained the first openly gay person in a mainline denomination: the Rev. William Johnson. In the following four decades, our General Synod repeatedly supported equal rights for homosexual citizens in pronouncements to local churches and actions directed to legislatures. Last year the UCC and its partners filed suit against North Carolina’s ban on same-gender marriage as a violation of religious liberty. In October, District Court Judge Max Cogburn agreed, striking down those laws as unconstitutional. Although some cite biblical texts to oppose marriage equality, we think these are taken out of cultural context and misapplied today. We remember in our all-too-recent history biblical texts were used to perpetuate systemic injustice toward women and people of color. While continuing to discern guidance from the Bible, we proclaim: “God is still speaking,” in new ways to address new realities. Our third core value is our belief that God is changing lives today. The gospels begin with a call to change and they end with the promise of transformation. The apostle Paul calls us to be transformed by the renewing of our minds. We hear testimony of such renewal every day, first from those who changed their minds because their hearts were changed. As more people brave the action of “coming out,” the rest of us realize we have congregants, co-workers, friends, and family members in the LGBT community. It is amazing how opinions can change as a result of personal relationships. A well-known evangelical leader, sociologist Tony Campolo, recently testified to his change of mind and heart, noting that it was not only the result of “hours of prayer, study, conversation and emotional turmoil” but also his friendship with gay Christian couples that facilitated his transformation. Perhaps more importantly, testimony of transformative change is given by those from the LGBT community who had given up on the Church, but who found stronger faith in Christ when they found a home in an open Christian community. Of course we acknowledge those among our congregants as well as colleagues who don’t agree with the decision of the Supreme Court nor understand why we, as clergy, so strongly support marriage equality. Indeed, we know some Christians who feel so negatively about this issue that they regard the movement toward marriage equality as a sign of the end times! Instead, we believe it is a sign of the in-breaking of God’s kingdom among us, that realm of love, justice and peace which Christians pray will come in our Lord’s Prayer. We reject the judgmental and at times hateful attitudes we have seen exhibited by others in the name of Christ, but we welcome and invite dialogue with those who disagree with us. This is not the first time people of faith have disagreed on important issues. And this is not the last word on this or any issue the Church is facing. So the UCC also proclaims: never place a period where God has placed a comma!